Samuel Aubert wears many hats in the cultural sector. He is the founding director of the open-air Les Siestes Electroniques festival (shown above), co-founder of the ICAS festival network and the SHAPE platform for innovative music and audiovisual art from Europe, member of the Ma Sphère cultural cluster, and publication director of Audimat magazine. For over 15 years, he has been involved in the organisation of artistic events, and the creation of new cultural entities. He has a PhD in the History of Art from Université Paris-Sorbonne, and a Master’s degree in Cultural Engineering from Université Paris 8. 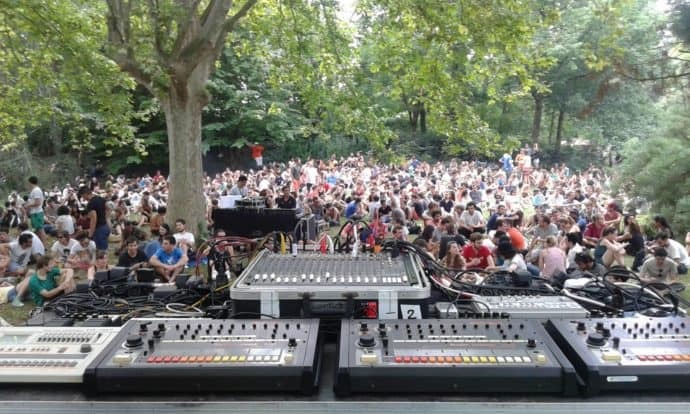 GM: Could you please introduce Les Siestes Electroniques festival – what it is, when and why it was founded? How has it developed since its foundation? SA: Les Siestes Electroniques is a music festival that was once focussed on electronic music and digital culture and which is now quite more open-minded. It all started in 2002, in Toulouse, in France, and has developed across the country (in Paris) but also the world (several editions have been organised in cities like Hanoi, Brazzaville, Montreal, Seoul or Milan). The original idea is still at the core of our action: to help as many people as possible to discover new music, new musicians, new aesthetics. At Les Siestes Electroniques, we love the “taste” of discovery, that feeling when you hear for the first time something that will follow you for the rest of your life. GM: In what ways are the Internet, sharing and digital culture important to Les Siestes Electroniques? SA: Most of the musicians we’re inviting to our events have been discovered while digging through the Internet. Internet is our first “discovery tool”. Without the Internet, I would never have watched a live video of the Indonesian band Senyawa and had the idea of inviting them. GM: How does copyright affect Les Siestes Electroniques? Are there particular problems caused by today’s copyright – for example, the fees that must be paid to national collecting societies? SA: There is no problem with copyright at the moment at Les Siestes Electroniques. We are paying our duty to the Sacem (the French collecting society for music rights), and even if that money didn’t exactly benefit the artists we’re inviting, that’s the common rule and I have no problem with that. GM: When did you first become concerned about Article 13 in the proposed Copyright Directive? SA: Around November 2017, we received an email from a member of the Create Refresh initiative. I’ve thus discovered the proposed Copyright Directive quite recently. GM: How widespread is the concern about Article 13 in the music and festival worlds? GM: How would Article 13 affect Les Siestes Electroniques and the artists who participate if the Directive is passed with the upload filter? What effect do you think Article 13 with its upload filter would have on the free Internet and digital culture? SA: Art is a question of cultural appropriation. There is no artist that can proudly claim that he never has tried to copy another artist’s work you’re inspired by – you would like to do something “à la manière de”. You have to confront yourself with someone else’s work. That’s all the creative process. Sampling is not a crime. It’s not even new. It’s the way ideas are passing from one to another. That process can’t be stopped. It’s way too dangerous and I can’t even imagine how they would like to do so. That would be extremely complex and in the end it will just kill the Internet. GM: What would you like to see happen with Article 13? SA: I hope the European Commission will decide to drop it! I’m pretty sure they will understand it’s not even doable. But they also have to understand it’s very dangerous to think that way. GM: More generally, how would you like to see copyright develop in the future in order to help you and the artists who take part in your festival? Featured image by Samuel Aubert.